Heat oven to 375°F. Lightly spray 14-inch pizza pan or 15×10-inch baking pan with cooking spray. In medium bowl, stir cookie mix, melted butter and egg until soft dough forms. Press dough in bottom of pan. Bake 10 to 15 minutes or until light golden brown. Cool completely, about 45 minutes. In chilled medium bowl, beat whipping cream with electric mixer on high speed until soft peaks form. Gently stir frosting into whipped cream. Spread over cookie pizza. 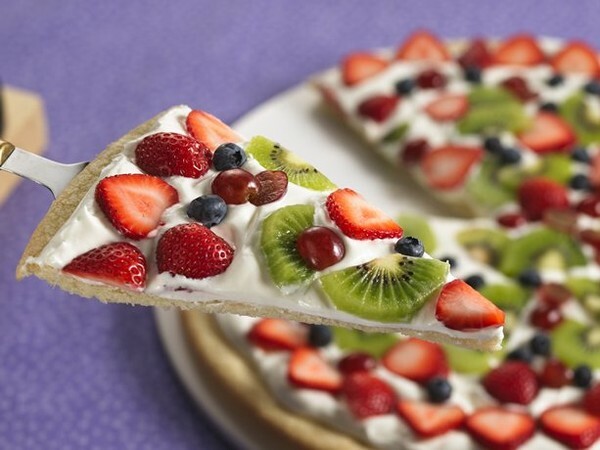 Arrange fruit on top.